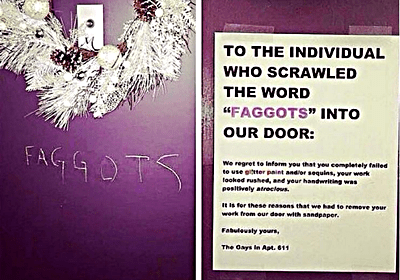 A gay couple in the United Kingdom crafted a wonderful response to a homophobic vandal who scratched the word “Faggots” into their front door this holiday season. They removed the vandalism and stuck an hilarious note in its place aimed at the bigot. ‘We regret to inform you that you completely failed to use glitter paint and/or sequins, your work looked rushed, and your handwriting was positively atrocious.